The outcomes of the trade negotiations between China and the US depend to some extent on which country is more eager to reach an agreement. That country will, arguably, come away with less. Although the trade tariffs hurt China more, it seems at first glance that the US should be more eager to reach agreement. After all, the thinking goes, President Donald Trump has to fight elections soon, while his Chinese counterpart, Xi Jinping, does not. The Communist regime can take a longer-term view, disregarding the effect on its people. Such thinking is deeply flawed. While Mr Trump may indeed settle for an easy, cosmetic win — without securing serious and verifiable measures to check Chinese expropriation of intellectual property — this may have more to do with the president’s personality than any intrinsic weakness of democracies in bargaining with unelected regimes. The administration of a democratic country enjoys something an unelected leadership does not: the automatic legitimacy of being in power having won an election. For the unelected regime, legitimacy has to be earned constantly through competent leadership. The regime can, of course, suppress mass public protest with force, but this is extremely costly and risks loss of control. Far better to enjoy widespread popularity so that the costs of repressing a small number of critics are kept low. Not only might the horizons of the leaders of the Chinese Communist party on matters of jobs and economic growth be just as short as those of democratic politicians, their choices may be more circumscribed. A democratic leader can blame a sequence of errors by previous administrations for the current parlous state of the stock market and the economy. Mr Trump can (and does) blame his predecessors for negotiating bad trade deals. And, while he currently uses the stock market as a barometer of his administration’s success, he may stop doing so if it turns south. Such flexibility in allocating blame gives democratic leaders some freedom of action. By contrast, even though Mr Xi inherited an over-leveraged economy, he cannot blame his predecessors for the difficult hand he was dealt or for the current slowdown. They too were from the party, and if the party is fallible, does it not follow that people should have the right to vote for a different regime? He has to maintain the fiction that the party has always made the best decision under the circumstances. That means the Chinese administration has to rescue the stock market if it tanks, and flood the economy with stimulus if growth slows significantly. In fact, it has very short horizons when reacting to potentially adverse economic developments. Chinese investors, confident that the government will bail them out if too many fail, pile in to risky assets without adequate diligence or fear, preventing Chinese markets from allocating capital appropriately. Mr Xi’s tight control over policy also makes it hard to diffuse blame. He must defend his own departure from his predecessor Deng Xiaoping’s dictum that to prosper, China should hide its capabilities and bide its time. From his early days in power, Mr Xi asserted that “the Chinese nation has gone from standing up, to becoming rich, to becoming strong”. Some argue his actions have been tantamount to waving a red rag at the Americans, and are directly responsible for today’s trade imbroglio. To quell criticism that he has dragged China’s growth down by challenging the US geopolitically too soon, Mr Xi needs a positive resolution to the conflict. None of this is to suggest that China behaves as if it is a democracy. It has a repressive apparatus to keep dissidents and minorities in place. But it does need to keep a broad majority satisfied. To be sure, the Chinese Communist party has earned its legitimacy after 40 years of expansion. Against the odds, the party is largely a meritocracy. The Chinese people are probably willing to cut it substantial amounts of slack. Yet the system works because no recent leader has taken that slack for granted. What does this mean for the trade negotiations? The Chinese administration is probably at least as politically constrained as the US. On the one hand, the Chinese are likely to be concerned about the adverse effects of the Trump tariffs on growth, investment, and employment, and would be hesitant to have citizens suffer much longer. Mr Xi is probably just as eager as Mr Trump for a deal. On the other, the Chinese are unlikely to accept anything that seriously compromises China’s future. Mr Xi has to sell the agreement at home — after all, he does report periodically to the National People’s Congress, which starts meeting this week, and the Chinese people are also paying attention. So to predict the outcome of this negotiation, it is best to treat Mr Xi as just another politician. ON MARCH 22ND Germany’s worst manufacturing survey in seven years sent investors rushing to buy bonds. 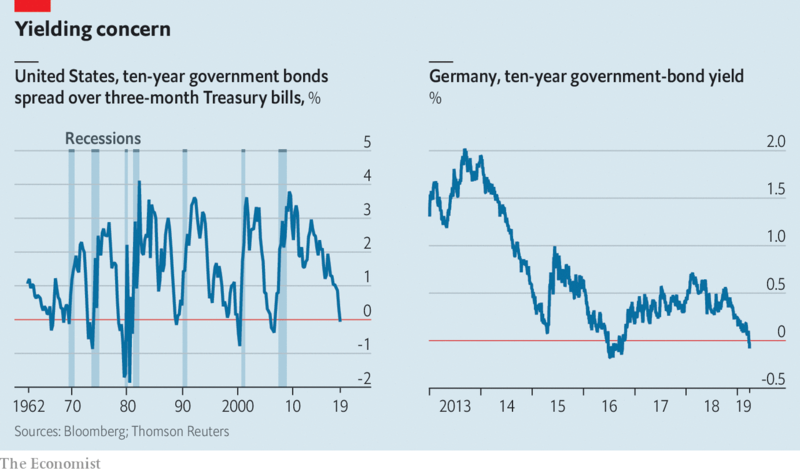 For the first time in three years yields on German ten-year government debt fell below zero, meaning that investors are willing to pay to hold it. And later that day in America the yield on ten-year Treasury bonds fell beneath that on the three-month variety. The last time that happened was 2007, one of the “inversions” in bond-market yields that preceded each of the past seven American recessions. These bond-market blues are fuelling concern that the global upswing in 2017 and 2018 is making way for a slump. There are reasons to worry. Tax cuts have boosted demand in America but will not be repeated; China has slowed; the trade war grinds on. However, indiscriminate global gloom is a mistake. America and Europe are in vastly different positions. Only Europe should be a cause of deep concern. America’s inverted yield curve suggests that the Federal Reserve’s interest-rate rise in December, its ninth in three years, will be its last for now. But that does not mean recession is imminent. The Fed has recognised—belatedly—that the risks to growth have risen, as Jerome Powell, its chairman, confirmed on March 20th. And America is in a position of relative strength. Unemployment is low; consumers are flush with cash; and underlying inflation is close to the Fed’s 2% target (see article). Europe is in a tighter spot. Although America may have finished raising rates, the euro zone has never got started. Growth this year could be little more than 1%. Wage growth is muted, inflation is below target and Italy is in recession. With rates close to zero, the response of the European Central Bank (ECB) has been to postpone monetary tightening and to provide more cheap funding for banks. Its willingness to do more may be limited. On March 27th Mario Draghi, its head, said that the ECB sees its inflation forecast as having been “delayed rather than derailed”. The primary cause of Europe’s slowdown—and particularly Germany’s—is falling global trade, notably China’s slackening demand for goods. The continent relies on Asian markets far more than America does and China slowed in late 2018. Policymakers there are now trying to stimulate the economy. A rebounding China could yet come to Europe’s rescue, especially if Donald Trump and Xi Jinping strike a trade deal. That the fate of the euro zone should depend on Beijing and Washington is a dereliction of duty. It is an economic superpower with its own fiscal and monetary levers. It should be countering downturns itself. More unconventional monetary stimulus will be hard thanks to northern Europe’s horror of appearing to create money to finance deficits. But the euro zone has room for fiscal stimulus. Its aggregate budget deficit was just 0.6% of GDP in 2018. Its net public debt was 69% of GDP. Because Europe lacks a centralised fiscal policy—itself a failure of politicians—the onus is on individual countries. Those with healthy finances, such as Germany and the Netherlands, could enact a co-ordinated budgetary loosening. They should focus on tax cuts and boosting public-sector infrastructure and defence spending. Unless they do, the euro zone risks falling back into stagnation—the trap it faced after the financial crisis. For the euro zone to tolerate that risk in the name of prudence is self-defeating. Astonishingly, the chances are that it Will. Many people cannot grasp how anyone could possibly support a coarse, narcissistic fantasist like US President Donald Trump. Michael D. Cohen's recent congressional testimony against his former boss provides one answer: the urge to flatter is as conspicuous as the spectacle of self-love. 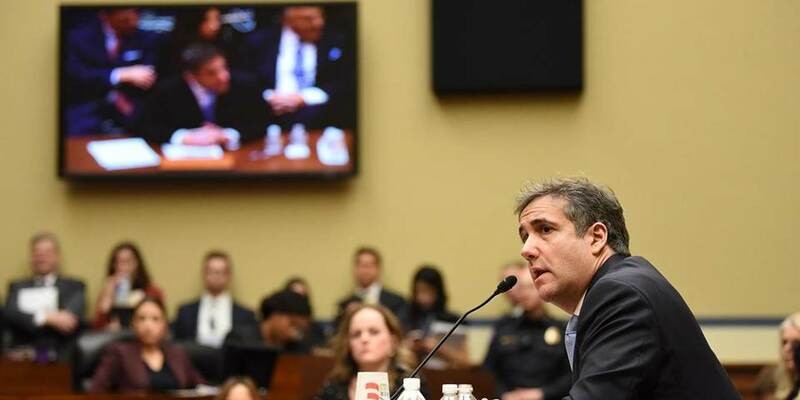 NEW YORK – Watching Michael D. Cohen, US President Donald Trump’s former lawyer and self-described “fixer,” testify to the House Committee on Oversight and Reform was a remarkable spectacle to behold. Cohen, who will soon begin serving a three-year prison sentence, has become what Mafiosi (and Trump) call a “rat.” Testifying against his old boss in Congress, Cohen neither looked nor sounded like a thug. He recalled a very different type of person. Anyone who has ever spent time in a school playground will recognize him: the weakling hanging around the swaggering bully, doing his bidding, while constantly being humiliated himself. With his hurt-puppy eyes and slack mouth, Cohen plays that part to perfection as well. But that is precisely the point. Of course it is all show – just like religious ceremonies, or Nazi or Maoist rallies. Trump may not be knowledgeable, sophisticated, curious, or well read, but he has a fine instinct for the psychology of power and submission. He knows how to weld people who feel weak and unrecognized into mobs drawn to his spectacle of angry charisma. His self-love makes his followers love themselves and hate their enemies. His is a great and dangerous gift. Trump’s massive rallies in the American heartland are his relationship with his former fixer writ large. One of Cohen’s more bizarre remarks in his congressional testimony was that he had lied, but that he was not a liar. Perhaps he meant this sincerely. His point might have been that he wasn’t really himself when he was lying for his boss. He was literally under Trump’s spell, mesmerized, almost sleepwalking. That is also what people say who once cheered wildly for dictators, and then can’t explain why they did so once the great leaders have fallen and times have changed. After months of pretending to ignore the subject, the European Central Bank has finally confirmed another bout of long-term lending. This won’t revive the slowing eurozone economy, but it will help cushion the blow for banks. On Thursday, the ECB announced a third round of its Targeted Longer-Term Refinancing Operations—or TLTRO—program, which will offer cheap two-year loans to eurozone banks, linked to lending to businesses and households. This makes the Frankfurt-based central bank the first in the developed world to ease policy again, following clear signs of a global economic slowdown. However, investors shouldn’t expect a fresh wave of credit to help the eurozone economy. When it comes to liquidity, central banks can bring the horse to water but not make it drink. After the 2008 financial crisis, the ECB pumped about €3 trillion ($3.4 trillion) into banks’ books, but lending didn’t jump—nor did it in other countries whose central banks did the same. Banks’ lending decisions are mostly made on the basis of how creditworthy their borrowers are, not the availability of funds. Banks have the ability to create deposits when they lend, and they can always tap the interbank short-term funding market, which the central bank is ultimately backing with a range of other operations. This is why TLTRO operations were never in huge demand. The most successful round was the last—because banks thought there would be no more—and it amounted to just €234 billion. The program’s main benefit is that it allows banks to circumvent banking regulations that authorities themselves impose. The loans are less long-term than they appear, because banks are forced to repay them if their collateral turns bad, but they do count as long-term for the purposes of rules that penalize short-term borrowing. The round therefore amounts to a small but welcome subsidy for European banks, which have had a dreadful run on the stock market. “If there were no subsidies nobody would take up the TLTROs,” ECB President Mario Draghi said Thursday. The TLTRO may end up being yet another case of a central bank giving with one hand what it takes with the other: Officials also signaled that interest rates will remain at record lows for longer than previously thought, which is bad for lenders. Eurozone bank stocks dropped about 4% Thursday. However, this could be an overreaction. Investors already knew that rates wouldn’t go up this year because the eurozone economy is slowing. Thursday’s announcement is still good for banks: No matter what happens, the ECB just threw them a bone. WASHINGTON — America’s trade deficit in goods with the rest of the world rose to its highest level in history last year as the United States imported a record number of products, including from China, widening the deficit to $891.3 billion and delivering a setback to President Trump’s goal of narrowing that gap. It is a case of textbook economics catching up with some of Mr. Trump’s unorthodox economic policies. Economists have long warned that Mr. Trump’s tax cuts would ultimately exacerbate a trade deficit he has vowed to reduce, as Americans, flush with extra cash, bought more imported goods. His trade war with Beijing also widened the gap: Stiff tariffs on Chinese goods helped slow China’s economy, crimping American exports, which declined nearly 50 percent in December from the same month a year before. The trade deficit is the difference between how much a country sells to its trading partners and how much it buys. It generally includes both goods and services, though Mr. Trump has focused almost exclusively on the deficit in goods. He has long boasted that his trade policies would reduce that gap, which he views as a measure of whether partners like China and the European Union are taking advantage of the United States, a diagnosis few economists share. Instead, in a year in which Mr. Trump imposed tariffs on Steel, aluminum, washing machines, solar panels and a variety of Chinese goods, the overall trade deficit grew 12.5 percent from 2017, or nearly $70 billion, to $621 billion, the Commerce Department said Wednesday. Although the United States recorded a trade surplus in services, the trade deficit in goods with the European Union and Mexico grew more than 10 percent as imports rose faster than exports. In December, the overall deficit in goods and services, which includes everything from computers and washing machines to tourism and intellectual property, rose 19 percent from the previous month, to $59.8 billion. It was the highest monthly trade deficit since 2008, when the American economy was mired in recession. Several global economic factors explain the widening of the deficit last year. China’s slowdown has reduced consumer appetite for American goods, as has slowing growth in Europe. The strength of the dollar in global currency markets has made it cheaper for American consumers to buy foreign-made goods, and more difficult for foreign customers to buy American-made ones. That helped fuel a record number of Chinese goods imported into the United States. 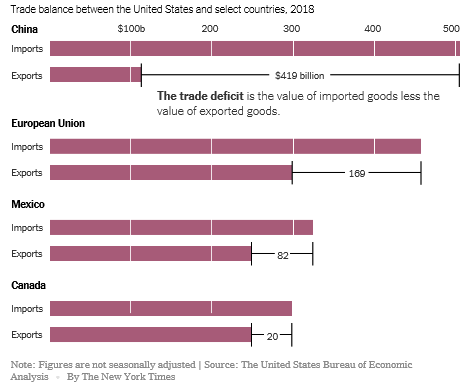 The trade gap in goods between the United States and China hit $419 billion in 2018, deepening a bilateral deficit that has been a particular source of anger for Mr. Trump. While Mr. Trump sees the trade deficit as a sort of economic scorecard for which country is on top, most economists disagree with this perspective, viewing trade deficits not as a sign of economic strength or weakness, but as a function of macroeconomic factors like investment flows, fluctuations in the value of currency and relative growth rates. And as the trade deficit widens, Mr. Trump’s focus on it has resulted in a particular irony: By his own metric, the president is failing to right America’s global trading relationships. Yet many of the president’s critics do not blame him for this, saying some fluctuations in the trade deficit are largely beyond his control. Mr. Trump has aimed tariffs at China, Europe, Canada and Mexico to help reset the trade balance with other countries that he says engage in unfair practices to gain a competitive edge in global trade. That is particularly true with China, which Mr. Trump and many business groups say tilts the balance of power by providing state subsidies, blocking foreign competition and engaging in other tactics. His top advisers are pressing Beijing to commit to a specific target for reducing the bilateral trade imbalance between the countries. While the Chinese have offered to make large purchases of American products, including soybeans and liquefied natural gas, they have resisted setting a specific dollar target for the trade balance, arguing that such a metric is largely beyond their control. The value of China’s currency, which is determined partly by the market and partly by the government, weakened against the dollar last year, blunting the effect of Mr. Trump’s tariffs by making Chinese goods even cheaper. The currency began rising again in the fall, as President Xi Jinping of China met Mr. Trump in Argentina late last year to begin hammering out a trade pact, said Brad Setser, a senior fellow for international economics at the Council on Foreign Relations. “China certainly allowed the market to push the value of the yuan down against the dollar over the summer,” Mr. Setser said. As part of the trade deal in the works, the United States has secured a commitment from Beijing not to artificially weaken its currency, according to administration officials. The relative strength of the United States economy is also a large factor in the widening deficit, along with the $1.5 trillion tax cut Mr. Trump signed in 2017, which accelerated growth last year. Money from the tax cuts helped Americans buy more imported goods than ever in 2018. And to finance the tax cuts, the government needed to borrow more dollars, some of which came from foreign investors. Foreigners primarily get those dollars by selling more goods and services to Americans, which will necessarily widen the trade gap, an effect that many economists predicted at the time Mr. Trump signed the tax cuts. The tax cuts are also helping to swell the federal budget deficit, which Mr. Trump similarly pledged to reduce — and, in fact, eliminate — as a candidate. On Tuesday, Treasury Department figures showed the budget deficit widening, and it is on track to top $1 trillion this fiscal year. Revenue from personal and corporate income taxes was down by 9 percent in January, compared with the same month a year ago. As with the trade deficit, many economists are growing less alarmed by the budget deficit than in previous years. However, Federal Reserve officials and some economists warn that federal borrowing is growing too quickly and will ultimately swamp the American economy, with the United States paying huge sums of interest on the debt, diverting funds from social safety net programs like Medicare and Social Security. The Fed chairman, Jerome H. Powell, warned lawmakers at a House hearing last week that the federal debt was on an “unsustainable” path. Mr. Powell was asked during the hearing if he would also say that the trade deficit was unsustainable. “I don’t think I would say that,” he replied.